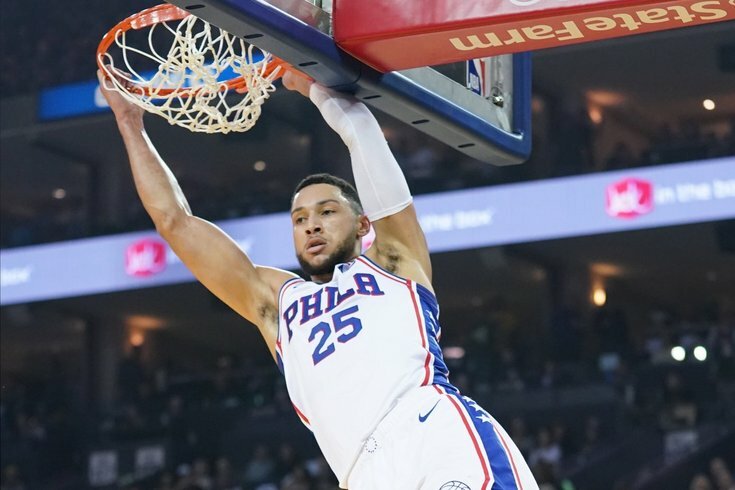 Philadelphia 76ers guard Ben Simmons dunks in a game earlier this season. Simmons wrote 'Egg Boy' on the yellow sneakers he wore during Tuesday's game against the Charlotte Hornets in honor of an Australian teen, now known as 'Egg Boy' for smashing an egg on the head of an Islamophobic Australian politician. Los Angeles Lakers team president and NBA Hall of Famer Magic Johnson stepped down from his position suddenly Tuesday night during a post-game press conference, sending shockwaves across the league. While the Lakers failed to make the playoffs this year, despite the addition of LeBron James, Johnson's choice appears to be about the personal restrictions of the job. Case in point: He'd rather be able to freely mentor young stars like the Sixers' Ben Simmons than be accused of tampering because of his role in L.A.
"When Ben Simmons called and we went through the proper channels, and they made me look like the bad guy in that situation, but I didn't do anything wrong, but do everything right," Johnson told reporters. "I was thinking about all those times, all guys who want me to mentor them or be a part of their lives, and I can't even do that. I have more fun on the other side." Earlier this year, Simmons reached out to Lakers representatives to see whether he might be able to talk with Johnson for personal advice on his game. It's natural that Simmons would want to emulate Johnson's success as a big-bodied NBA point guard. Simmons also sought to connect with several other players for guidance, including Dr. J and Kobe Bryant. Johnson, of course, made an offhand comment about helping Simmons to the press, which set off a firestorm of criticism and a league investigation into tampering. The NBA found no wrongdoing. At the time, Sixers general manager Elton Brand clarified that he chose not to approve the meeting between Johnson and Simmons. Why? The Sixers have every reason to guard Simmons as he approaches his second NBA contract. What happened with Anthony Davis in New Orleans this season is proof enough that the Lakers allure can be a menace and a threat, even if they don't get their way. What Johnson's departure means for Los Angeles — and how it reflects on LeBron James' choice of L.A. over Philly — is another conversation altogether. His role may have been largely symbolic (a clincher for recruitment purposes) and secondary to general manager Rob Pelinka, according to reports. If nothing else, this gives Simmons the opportunity to learn from an idol who can make him better on the court. His commitment to the Sixers, which he's publicly stated, for whatever that's worth, will probably be solidified best by postseason success in Philadelphia.